Visiting Paris is memorable enough with its epic architecture and world-class museums. And then you add the food. The French know food. I recall Julia Child writing about her first, and one of her favorite meals, in France, sole meuniere. The French work their magic with butter, fresh herbs and lemon juice and spoon it over the fish and it becomes a sublime dish. For a très spécial addition to your Paris itinerary in 2017 and beyond, plan a lunch, dinner and/or stay at the Hôtel de Crillon, near the Place de la Concorde and off the Avenue des Champs-Élysées. At the very least, take a tour of the Crillon and bask in its lavish history. The hotel first opened in 1909 and is housed in a palace originally built in 1758. It closed in 2013 for what was to be a two-year update. The much-anticipated renovation is said to be on schedule for completion in 2017. On my very first trip to Paris in 2006, I wanted to visit a Michelin starred restaurant. 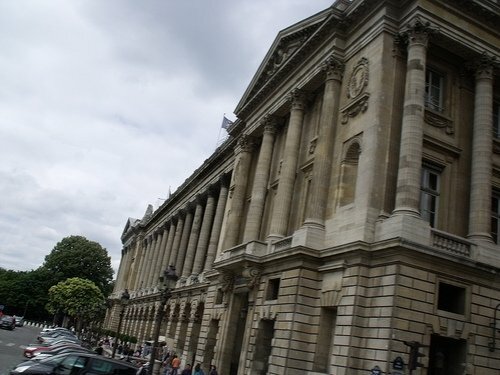 As I planned our trip I ran across mention of the Hôtel de Crillon, located in the Right Bank and in the 8th Arrondissement, and its restaurant, Les Ambassadeurs. Under Chef Jean-François Piège, the spot had earned two Michelin stars in 2005. We booked dinner. The memory of that dinner has become a legend in our household. My husband likes to tease that I sold a used Ford to pay for the dinner. It wasn’t quite like that. But we went all out that night in honor of his birthday. It was worth every euro. The only way I can begin to describe it is to say it was like a food and wine Fantasyland for adults. Meaning, the same way that your senses are overwhelmed at a place like Disneyland, but this dinner wasn’t one you wanted to escape from with a cocktail by the pool. No, it was quite the opposite. You couldn’t believe the beauty, the flavors and the aromas. I imagined it was like what a child feels the first time they enter the gates of the Magic Kingdom, thinking – I want to try it all. Course after course arrived, and the food was other-worldly and artful. I remember a plate of hors d’oeuvres that included a round ball that looked like a rather large, smooth chocolate truffle. I was fascinated, having no idea what was inside. I popped it in my mouth and, and to my delight, I savored hot, silken Fois Gras swirling around on my tongue. Each dish was like opening a present of flavors; you took in the wrapping and couldn’t wait to taste what was inside. On our visit, the 18th-century ornate, rococo style of the dining room included dazzling reliefs and delicate wall and ceiling paintings. While the upgrade will bring modernity, the historic preservation of the classical architecture in the original structure, is a priority. The Les Ambassadeurs is no more, but when the Crillon is again unveiled, this elegant palace will include several new restaurants that, I imagine, will hold promise of someday earning their own Michelin stars. Keep checking in at the Rosewood Hotels website (https://www.rosewoodhotels.com/en/hotel-de-crillon) on the progress of bringing the Crillon back to life.